This 5 Minute Grape Sorbet comes together in just minutes and tastes like any other decadent sorbet. And the best part? You just need three ingredients! In a food processor, puree frozen grapes, scraping down the sides as needed. Add in remaining ingredients and puree until smooth. 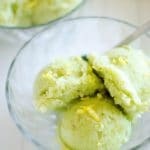 Recipe from Live Eat Learn at https://www.liveeatlearn.com/5-minute-grape-sorbet/.